Cassini captured this view of Saturn’s rings on Sept. 13, 2017. The final photos taken by NASA's Cassini Saturn orbiter have begun coming down to Earth, and you can see them all. Cassini is clearing its memory ahead of its dive into Saturn's atmosphere early Friday morning (Sept. 15), a suicide plunge that will bring the storied spacecraft's 20 years in space to a dramatic, fiery end. Cassini image of Saturn’s geyser-blasting moon Enceladus, captured on Sept. 13, 2017. The $3.2 billion Cassini-Huygens mission — a joint effort of NASA, the European Space Agency and the Italian Space Agency — launched in October 1997 and arrived in orbit around Saturn on the night of June 30, 2004. A photo of Saturn’s huge moon Titan, captured by NASA’s Cassini spacecraft on Sept. 13, 2017. A lander called Huygens piggybacked aboard the Cassini mothership, eventually touching down on Titan's frigid, otherworldly surface in January 2005. The orbiter, meanwhile, kept cruising through the Saturn system, studying the giant planet, its rings and its diverse panoply of moons. Cassini's discoveries have fundamentally reshaped scientists' understanding of Saturn, and of the solar system's life-hosting potential. For example, the orbiter spotted lakes of liquid hydrocarbons (mostly methane) on Titan's surface, and its observations suggest that the huge moon also hosts an ocean of salty water beneath its crust. 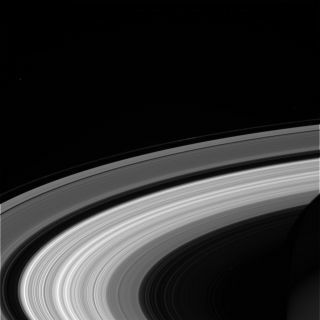 Another image of Saturn’s rings taken by Cassini on Sept. 13, 2017. And Cassini spotted geysers of water vapor blasting from the southern reaches of the 313-mile-wide (504 kilometers) moon Enceladus. Further work by Cassini indicated that this water is coming from a buried ocean, which likely contains a source of chemical energy for microbes, if any ever evolved on that distant moon. But Cassini is running out of fuel, and mission team members want to dispose of the spacecraft responsibly before it escapes their control. They decided to steer it toward a fiery death in Saturn's atmosphere primarily to protect Titan and Enceladus — to ensure that any Earth microbes that may have hitched a ride aboard Cassini never contaminate those two possibly habitable moons. Cassini took its last photo — a shot of the patch of atmosphere where it will meet its doom — at 12:58 p.m. PDT (3:58 p.m. EDT, 1958 GMT) Thursday (Sept. 14). Nearly two hours later, the probe began relaying all the information on its solid-state recorder to mission control, to prepare for a transition to near-real-time data transmission during its suicide plunge. Cassini shot of Saturn from Sept. 13, 2017. That plunge is nearly upon us: The loss of signal indicating Cassini's death is expected at 4:55 a.m. PDT (7:55 a.m. EDT, 1155 GMT) Friday. If it's any consolation, Cassini's death should be very quick. During the dive, the orbiter will be going so fast, and Saturn's atmosphere will be thickening from its perspective so quickly, "that Cassini will be vaporized in I think maybe 2 minutes — [actually] I think more like 1," Cassini project manager Earl Maize, of NASA's Jet Propulsion Laboratory in Pasadena, California, said during a news conference Wednesday (Sept. 13).